The Labor party on Thursday approved a series of revisions to its charter proposed by newly elected chairman Avi Gabbay, giving the new leader expanded powers and allowing him to reserve four slots for the candidates of his choice on the party’s Knesset list. Convening in Tel Aviv, Labor members overwhelmingly voted in favor of all the amendments introduced by their newcomer commander-in-chief, who has positioned himself as a challenger to Prime Minister Benjamin Netanyahu in the next general election, currently set for November 2019. Speaking at the convention, Gabbay had implored party members to support the changes. Of the four candidates Gabbay can appoint, two may be put in the top 10, while the other two may be included anywhere between no. 10-30 on the slate. The candidates need not be members of the Labor party upon their selection, the amendment stipulated, nor do they need to have run in the Labor primaries. Those conditions give Gabbay — a newcomer to the Labor party himself, and a former minister in the center-right Kulanu party — freedom to incorporate big-name candidates into the party. Former IDF chiefs of staff Gabi Ashkenazi and Benny Gantz and former prime minister and Labor leader Ehud Barak have all been rumored to be considering a political run or comeback — though all have so far denied the speculation — and former defense minister Moshe Ya’alon has also announced he will mount a challenge to Netanyahu. Another amendment grants Gabbay full control over the party’s budget and economic affairs, allowing him to fully set the tone of the party’s next political campaign. Moreover, should Labor win an upcoming election and be tasked with forming a government, the Labor party leader will be solely responsible for appointing ministers, after consulting with other party officials. A further change, aimed at cementing Gabbay’s control over the party’s parliamentary affairs in the Knesset as he is not a sitting MK, gives him the authority to appoint the faction leader, as well as Knesset committee chairs and members. The changes to the Labor code also include new transparency requirements on spending and calls for the formation of various election campaigning bodies within the party. Gabbay, who served as environmental affairs minister under Netanyahu before quitting in May 2016, also railed against the corruption probes into the prime minister and his associates. In July, Gabbay, 50, was elected as the new chairman of Labor, beating veteran lawmaker and former faction leader Amir Peretz in a dramatic turn of events for the long-embattled party. 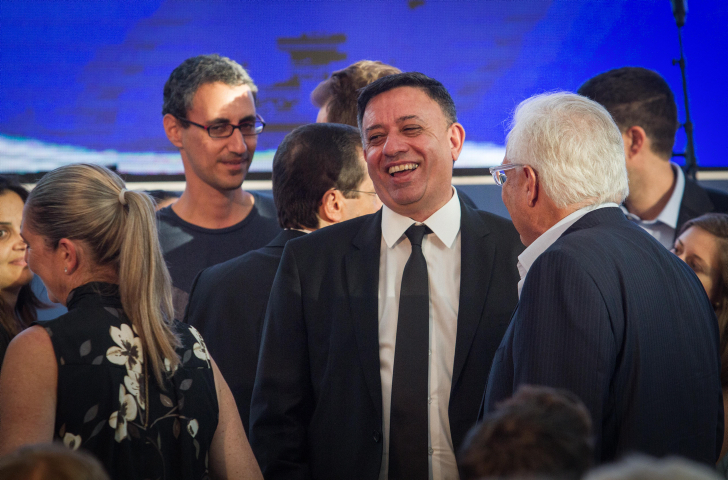 During that campaign, Gabbay, a former Bezeq telecommunications CEO was seen as the dark horse in the race, bringing fresh blood and a right-wing political history to the traditionally dovish party. He claimed to have brought thousands of new members to the Labor party, a fact that may explain his surprise victory. Gabbay quit Netanyahu’s cabinet after coalition talks brought the Yisrael Beytenu party into the coalition, with a dramatic tirade accusing the governent of leading Israel on a path to destruction. 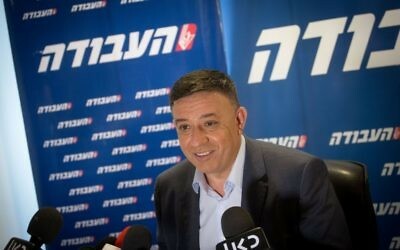 That breakout moment for Gabbay, a relatively unknown minister who was not elected to Knesset but rather appointed as an external candidate by Kulanu party leader Moshe Kahlon, was followed by his crossing the political aisle and joining the fight for the Labor leadership. Gabbay’s victory in the Labor primaries saw him immediately taking the post of party leader, and launching an election campaign to oust Netanyahu. Since he is not a Knesset member, Labor’s ousted leader MK Isaac Herzog remains opposition leader in parliament.